Very satisfied all round. Speed of delivery was excellent. Top marks. Great service once again from Tayna. 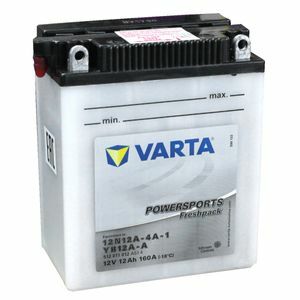 A good quality Varta battery at the right price, well packaged and with next-day delivery. Clear, easy to understand instructions are a bonus these days! Many thanks. Adapté à: Honda VF500C 500cc 1984! Exactly the right battery for the bike,Great service to. I bought this battery as a direct replacement for the varta battery which had given 8 years trouble free service on my 250 cc scooter. I am very impressed by this brand and also the excellent service from Tayna. I would recommend both 100 percent. Easy to fill and fit. Charged it using my smart CTec battery charger. Bike is now back to life and starts first button again. The Tayna web site enables easy selection of the most appropriate battery. With good prices and extremely quick delivery, Tayna is an excellent choice. I was very happy with the speedy service. However the image of the battery was out of date due to product updates. I got around it by modifying the terminal. An excellent battery that works well and was sent promptly and efficiently. I would not hesitate to recommend Tayna Batteries and their products to anyone. a good quality battery is essential for reliability! after restoring/ renewing the 37 year old electrics and loom on my bike, the kickstarter finally gave up for good (the arm fell apart) - so I do rely entirely on my battery now! - until hell freezes over and a kickstarter for my type of bike gets re-manufactured by someone... Thank you for being the only supplier of Varta batteries for Northern Ireland as well!